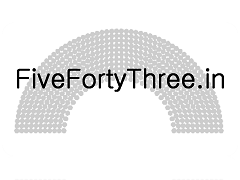 FiveFortyThree: Should Pollsters be banned? There is much discussion in the Indian media on whether opinion polls should be banned. Of course, our view is biased. In our analysis of the upcoming Lok Sabha elections, our predictions will be based on the opinion polls conducted by groups such as the CSDS. Without these opinion polls, we will not be able to aggregate and predict outcomes. There is, however, little evidence that opinion polls have a significant effect on voters. During the recent assembly elections, the CNN-IBN polls were able to predict victories in Rajasthan, Chhatisgarh and Madhya Pradesh. Although AAP support was underestimated, the opinion poll still predicted the order of the winning parties correctly. Even so, it was not able to take the next step in predicting alliances. Even though the BJP had the largest number of seats, it was unable to form the government in Delhi. Ultimately, the AAP and Congress joined hands to form the Government. For those, like ourselves, wanting to predict the Lok Sabha elections, this is the uniqueness of India’s multiparty system that makes it hard to predict who will ultimately form the government. As former Lok Sabha elections have shown, alliances can change post-election . Predicting seats is one thing. Determining who will ultimately form the Government can be a wholly different exercise. During the 2004 Lok Sabha election most opinion polls had predicted an NDA landslide. However, it was the UPA that formed the Government. The opinion polls had been wholly inaccurate in their overall predictions. However, looking at their predictions on the State level showed some accuracy. Opinion polls for Rajasthan, Haryana, Karnataka, Tamil Nadu, Odisha, West Bengal, Uttar Pradesh, Bihar, Jharkhand, Maharashtra, and Punjab were mostly accurate. However, for Gujarat, Uttarakhand, Himachal Pradesh, Andhra Pradesh, Assam and Delhi, the polls were mixed. For Gujarat, it could be equated to the Modi effect – even though everyone said they would vote BJP, potentially out of a misconceived fear, on voting day many still voted for other parties and the BJP captured 47.78 percent of the vote. In Assam, where conducting surveys is difficult, a BJP win was overstated in the opinion polls and Congress carried more seats than the other parties with 35% of the votes. Based on our analysis of opinion polls from 1998-2009, we would state that certain pollsters show a high level of by-state accuracy. There is little evidence that opinion polls have influenced voters greatly. Rather than banning opinion polls, we should demand more transparency from those conducting them. At its basics, what is the sample size, methodology and margin of error for each poll? In fact, the pollsters should all belong to trade bodies which demand quality and transparency, as has happened in other countries. The solution is not banning pollster. Rather, there should be more transparency in how each poll is conducted.